Arriving on a glorious sunny spring evening, BRO DISTRIBUTOR was inbound from Dublin as she was seen heading towards Finnart on Sunday. 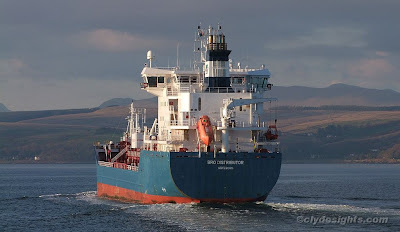 As usual, the 2006-built ship, of some 14,907 tonnes deadweight, was here to load a cargo of petroleum products for Belfast. Lovely light and shot ! !